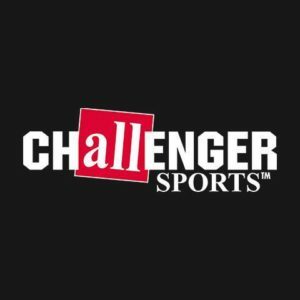 Challenger Sports Review by Jenna Jackson | Challenger Sports British Soccer Camps are so much fun! the jackson five family received a complimentary british soccer camp while working with usfamilyguide.com. however, all opinions are honest and our own! 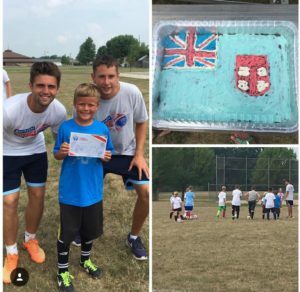 Grady attended Challenger Sports British Soccer Camp for a week this summer and what a blast he had. If you have a soccer player then this camp is a must to attend! Challenger’s British Soccer Summer Camp is the most popular camp in the USA and Canada. With an innovative curriculum that develops skills, speed and confidence in players of all ages and abilities. These camps provide boys and girls with the rare opportunity to receive high-level soccer coaching from a team of international expert’s right in the heart of the their own community. 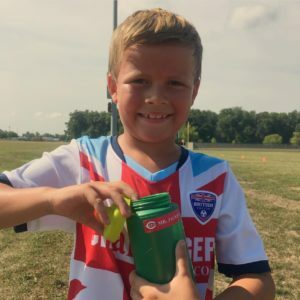 In addition to teacher new skills and improving game performance, each British Soccer Camp provides lessons in character development, cultural education and is the most fun your child can have learning the sport the love! Grady loved the camp and will definitely be going back. The coaches are amazing at what they do. Not only do they teach fundamentals, but they make learning so much fun. They sing songs, play games and really take the time to make sure the kids are having a good time. At the end of the camp they get a signed certificate and the kids loved getting jerseys and soccer ball too! we would highly recommend british soccer camp!